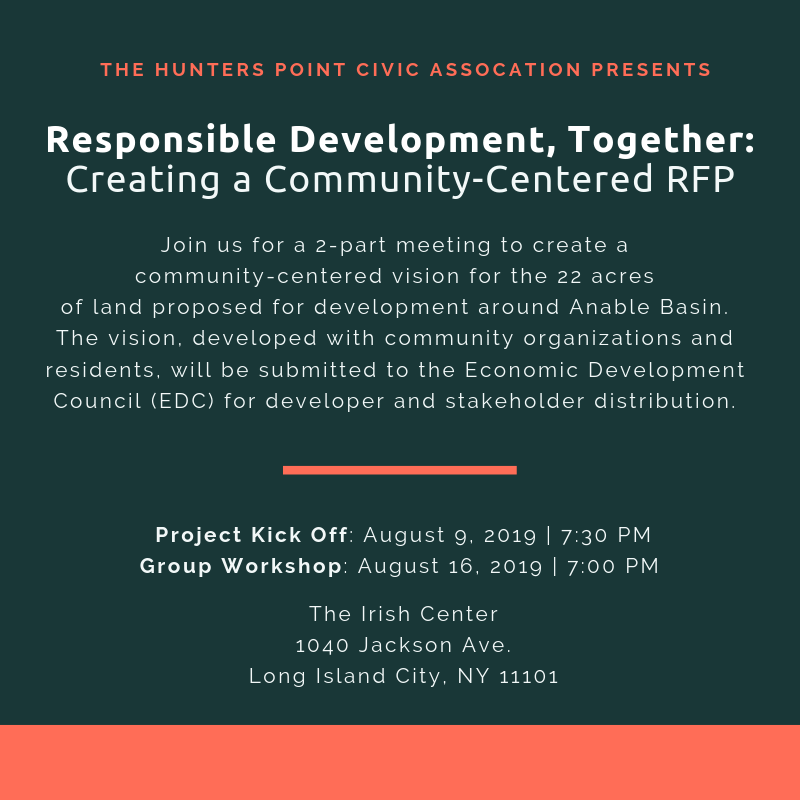 The Hunters Point Civic Association is hosting a 2-part meeting to bring together community groups and residents to participate in a community-centered vision for the 22 acres of land which is proposed for development or publicly owned around the Anable Basin. Our collective output will be presented to the Economic Development Corporation (NYC) and form the "Community's RFP" (Request for Proposal) to be distributed to stakeholders and developers who intend to develop the land and/or bid on the project. This approach centers the community’s values in the bidding process and allows us to proactively influence the developer’s bids. Our first session will serve as a kickoff to establish the area’s history,overview the development process, and bring together a community vision of development based on the community’s shared values. (CEQR), and its past and present implications for Long Island City. Since 1893, the Municipal Art Society has been one of the city’s premier not-for-profit organizations advocating for smart urban design, city planning, and historic preservation. The second session will be an active workshop, in which small groups will work to produce ideas that will reflect the community’s values and needs in areas such as environment, education, affordable housing, economy and recreation in context of the area of development. The first meeting will take place on April 9 at 7 p.m. at the Irish Center (1040 Jackson Ave). The second meeting will take place on April 16, 7 p.m. at the Irish Center (1040 Jackson Ave). Older PostRSVP to February's Community Forum: Meet the Public Advocate Candidates!